A Newly Renovated Option In Key West Hotels And Accommodations Discover the true spirit of the islands, as well as the area's best value, at the beautifully renovated Fairfield Inn & Suites by Marriott Key West. Our conveniently located Key West Florida hotel offers signature Marriott comfort and style - just minutes from pristine beaches and the shops, restaurants, and clubs of world-famous Duval Street. Choose from more than 100 redesigned guest rooms and suites, including poolside accommodations. Stretch out on a luxurious, brand-new pillow-top mattress while you decide what amazing activities to enjoy. Completely updated as part of an extensive, $7.5 million renovation, our Key West hotel rooms offer exceptional service in an outstanding location: Located on Highway 1, just minutes from downtown Key West, Florida Only two miles from the non-stop excitement of Duval Street Minutes from the magnificent sunsets at Mallory Square Less than 10 minutes from Key West International Airport (EYW) Click here for more Sights & Attractions near our Florida Keys Hotel. Unexpected Amenities At Our Updated Key West Florida Hotel Be among the first to enjoy the stylish updates at our Marriott hotel in Key West, Florida. Brand-new sandstone tile, luxurious new bedding, and a state-of-the-art fitness center add an upscale feel to this casual and comfortable hotel. Start your day off with a complimentary continental breakfast served poolside - be sure to come back for happy hour at the end of the day! Relax in our massive outdoor pool, one of the area's largest, complete with 12 decorative fountains. Take the delightful Conch Tour Train and Trolley to a variety of local attractions and tourist spots. Let our friendly, multilingual staff help you make the most of your stay. Indulge in wonderful island living and first-rate features at this Key West Florida hotel, including: $7.5 million hotel renovation, completed in Spring 2007 106 beautifully updated rooms and suites, with Marriott-quality amenities 72,000-gallon, temperature-controlled outdoor swimming pool, complete with 12 decorative fountains State-of-the-art fitness center, with free weights and cardiovascular equipment Free high-speed wireless Internet access, throughout the hotel Poolside Tiki Bar, with daily Happy Hour specials Complimentary deluxe continental breakfast, served daily at poolside, includes Jimmy Dean breakfast sandwiches, bagels, muffins, fruit, yogurt, and more Business center, with fax and copy machine service available Market, selling snacks, sunscreen, and other essentials On-site Scooter and bicycle rental, available through Ahi Rentals Free self-parking, for hotel guests Marriott Rewards, frequent guest program Click here for more about our Key West Lodging Features & Services. Feel free to relax at the beautifully restyled Fairfield Inn & Suites by Marriott Key West - ideally located close to beaches and the excitement of Duval Street. Offering redesigned accommodations, luxurious new bedding, and a 72,000-gallon, temperature- controlled outdoor pool, we're only minutes from downtown Key West. 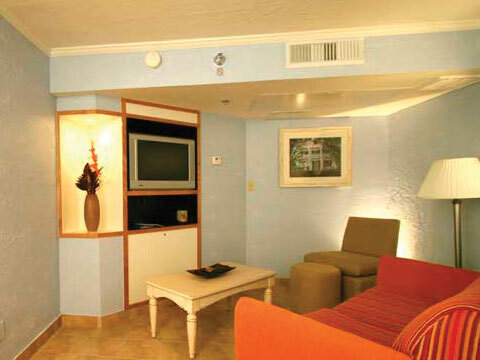 Book your Key West hotel reservations online today for Marriott's "Look No Further" Best Rate Guarantee.